Betnovate Scalp Application contains the active ingredient betamethasone valerate, which is a type of medicine called a corticosteroid. Corticosteroids are medicines used for reducing inflammation. Inflammation of the skin happens due to the irritation of the skin, and is caused by the release of various substances that are important in the immune system. These substances cause blood vessels to widen, resulting in the irritated area becoming red, swollen, itchy and painful. When betamethasone is applied to the skin it works by acting inside the skin cells to decrease the release of these inflammatory substances. This reduces swelling, redness and itch. Betamethasone is a potent corticosteroid that is applied to the skin to treat a wide variety of inflammatory skin diseases, such as eczema. 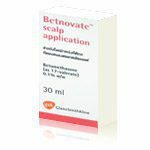 Betnovate Scalp Application contains betamethasone formulated as a scalp application, which is thinner and easier to apply to the scalp than the betamethasone ointments and creams used on the rest of the body. It is used to treat inflammatory disorders of the scalp, such as psoriasis and seborrhoeic dermatitis. What is Betnovate Scalp Application used for? * Wash your hands after applying this medicine to avoid inadvertently transfering it to other areas. * This preparation is for external use only. * If you have been prescribed this medicine to treat psoriasis you should have regular check-ups with your doctor. This is because although corticosteroids may be useful for psoriasis in the short-term, they can sometimes make psoriasis worse, and may cause the condition to relapse into generalised pustular psoriasis after the treatment is stopped. * Betnovate Scalp Application should be applied thinly and evenly to the affected area(s). * Avoid contact of this medicine with the eyes and the moist membranes lining the inside of certain parts of the body, eg mouth, nasal passages (mucous membranes). Rinse with cold water if accidental contact occurs. * Do not use for longer than 5 days in children. * This medicine contains flammable alcohol. Avoid naked flames and lighted objects, such as gas and electric fires and lit cigarettes, and the use of artificial heat, eg hairdryers. * Some brands or preparations of medicine containing this active ingredient are not recommended for use in children under certain ages. Consult the package literature provided with the medicine for further information. * This medicine should not be used for prolonged periods of time, particularly in children, as long-term use may increase the amount of medicine absorbed into the bloodstream and the risk of adverse effects. * This medicine should not be used during pregnancy or breastfeeding unless considered essential by your doctor. If it is prescribed by your doctor it should not be used on large areas of skin, underneath dressings, or for prolonged periods of time. Consult your doctor for further information. * Caution flammable: keep medication away from fire or flames. * This medication is to be spread thinly and sparingly on the skin.